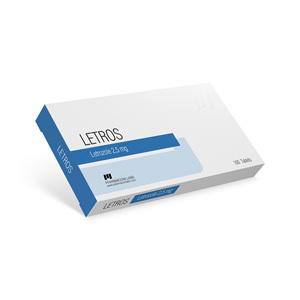 Letrozole Letros 2.5 is one of the most effective non-steroid preparations of aromatase inhibitors. Popular in 65 countries. This drug has blocking properties for aromatase enzymes. Very difficult to understand, right? Let’s see how letrozole is used in bodybuilding. Letrozole found use among bodybuilders and other athletes. In sports, the drug is used as an additional element on a course of steroids to reduce estrogen levels and a small increase in testosterone. Letrozole is considered one of the best drugs in its sphere of influence, therefore, is well known among bodybuilders. Studies have shown that the drug can reduce the concentration of estrogen to 97%, which proves its high efficiency. But if you take the recommended dose, the concentration decreases only to 76-79%, which is also not bad. Low levels of estrogen affect the reduction of side effects on the course, which is very important for athletes. It was also noticed that the use of letrozole in bodybuilding increases the production of certain hormones (luteinizing, follicle-stimulating hormones, globulin), and they, in turn, increase the production of testosterone. Elimination of gynecomastia at the initial stages of the course. It allows you to save muscle tissue after a course of catabolic processes (in the world of bodybuilding, the concept of “catabolic” breakdown after taking steroid drugs is very well known). Reception of letrozole will be very expedient if anabolic steroids and androgens are listed in the course of the drugs taken. Letros 2.5 in bodybuilding is recommended to take 1-3 mg per day (you can at any time of the day). Studies have shown that even 100 micrograms per day very effectively inhibit the action of the aromatase enzyme. Exceeding the recommended dosages can lead to negative phenomena in the form of reduced sexual desire. The daily dose for each athlete will be different, depending on the age, experience, duration of medication, but should be in the range of 1 to 3 mg per day. You can get to know your individual rate from specialists; before taking any pharmaceutical preparations, it is best to consult a doctor. After a long intake of the substance, it will be possible to switch to another dosage regimen – to use letrozole not every day, but every other day. If during the course dosages of letrozole can vary quite dramatically, then at the PCT, the standard dosage is 2.5 mg of letrozole daily for 7-10 days, and then 0.5 mg every day for two to three weeks. It should be said that such side effects can only cause higher doses of the drug. If you follow the recommendations of the application, you can avoid such reactions.